Last but not least the Compass looks great, like it actually belongs with an iPad. I tell all my friends that this is the iPad accessory to have. 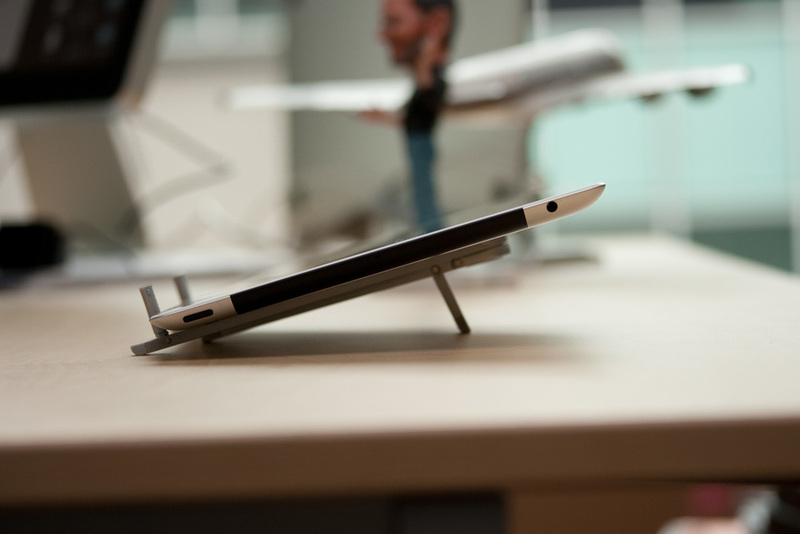 Simply put it is the best iPad stand out there (and has been since the iPad 1 days). The Compass is beautifully made from heavy gauge steel which also gives the Compass a nice hefty feel. It is also versatile as it can hold an iPad in portrait, landscape and typing orientations. The Compass is also compact and can be easily transported around with the iPad (a carrying case is also included). Last but not least the Compass looks great, like it actually belongs with an iPad. Available in silver, matte black and glossy red. More details here. These have the usual trimmings like triple button remote with mic plus some fancy ones like titanium housings and kevlar reinforced cables. Want audio a bit more substancial than the speaker on the iPad? Or just don't want to disturb the people around you? Then check out the Nocs NS400 earbuds. These have the usual trimmings like triple button remote with mic plus some fancy ones like titanium housings and kevlar reinforced cables. Most importatntly the NS400s also sound great with crisp bass and excellent detail. Available in black and white. Find out more here. See that beautiful retina display, it might be all shiny and new now but you know that it will get grotty, particularly if you lend it to a few people or take it to the can with you (for shame). Luckily for you we have a solution. The Techlink iPad cleaning kit is a portable cleaning kit for the iPad and keyboards. The kit comprises of, a spray bottle with anti-bacterial cleaning solution and a case which has two sponges, a smooth side is for the iPad screen and the other side is for keyboards. Also included are two refills and a carry bag. Techlink has a full range of cleaning products for all Apple devices, check out the range here.